Can’t wait to finally catch your trophy trout? Well, try it in Noontootla Creek and you’ll surely get your chance. This beautiful creek is one of the best trout fishing areas in the southeast of the country. Listen to our interview with Kent Klewein an expert North Georgia fly fishing guide and find out how. Kent Klewein became a fly fishing guide at an early age of 10. 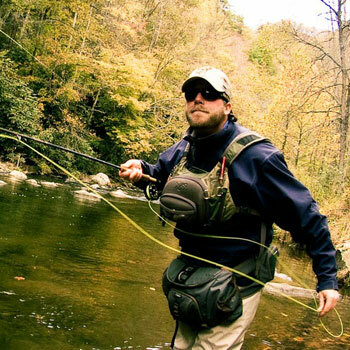 He became a fulltime guide in North Georgia and North Carolina upon graduation from college with a Bachelor’s Degree and Business Administration and the completion of Bressler Outfitters fly fishing guide school in 2000. He is well-known for being the top guide for putting clients on trophy rainbow and brown trout on the Toccoa River and the Noontootla Creek as well as other tributaries in North Georgia. He has been recognized in publications and media such as The Southeast’s Best Fly Fishing, American Angler Magazine, Georgia Sportsman’s Magazine, Trout Unlimited Magazine, ESPN The Fly Fishing Masters, and Aarons Outdoors - Pursuit Channel. He has also been featured in fly fishing catalogs for Scott Fly Rods, Korkers, and Redington. Noontootla Creek is a mountain trout fishery located in North Georgia, southeast of the United States. It is the biggest tributary of the Toccoa River. The creek is divided into both private and public sections. For the trout fishery itself, majority on the private section is wild trout, wild rainbow, and brown trout. In the public section of the Nontootla Creek, there is 100 per cent wild rainbow trout and brown trout. Some brook trout are also present up in the high head waters of the creek and its tributaries. It is relatively a small stream with a lot of pocket water, boulders, and rhododendron, but it’s a very good place for anglers to not only challenge themselves, but also improve their skills since the stream demands it. At the foothills of the public section of the Noontootla Creek, you will be looking at around 2400 feet with the headwaters pushing over 3,000 feet of elevation. The area is quite hilly and mountainous. There are also sections that are easy to get in and out of and fish and wade. There are three good tributaries in Noontootla – Lovinggood Creek, Long Creek, and Fridge Creek – all of which have significant amount of fishable water. Lovinggood Creek is the best and the biggest tributary of Noontootla Creek. It offers a lot of brook trout since it is on the top half. Fishing for brook trout requires high enough water for anglers to start catching them. Anglers need to be above the barriers where the rainbows and browns can’t get up. In Long Creek, you have to go over a 30-foot waterfall to get brook trout. Fridge Creek is located around a mile upstream. In the fall, there is a good population of brown – around 30 to 40 percent - that swim upstream into Noontootla Creek and other tributaries of the Toccoa River to spawn. The majority of the brown trout that are moving upstream to spawn on the Toccoa, stay in its main branches. A lot of people underestimate the degree of smartness that the trout in Noontootla have. They are wild fish with great instincts. There are a lot of predators here and quite a bit of fishing pressure. To have success in the public section, the first thing you need is patience, especially in wading as quietly and slowly as you can. The next thing is to wear camouflage, green, or earthly tone colors since fish will pick you up coming downstream 50 yards down. The third thing is to take the time to find vantage points where you can sight fish so if you spot a big fish, you can quietly get back down in position. A lot of times, in Noontootla, you only get one or two shots. They are either not going to eat or they are going to get spooked. If you’re looking for a guide in Noontootla, it takes at least a month to make reservations to get a guide – that is, during slow seasons. During peak seasons, it will take around a month-and-a-half or two. Although the Noontootla is a year-round fishery, fishing slows a little bit during the colder months. For bigger catches in the public water of Noontootla, there are two best times to fish – during late spring and late fall. Noontootla Creek is one of the most fertile streams in North Georgia. There are mayflies, stoneflies, caddis, and midge populations. The fertile streams are mostly because of the national forest or wildlife management area. There is no development here so you have good gravel and rock that is obviously the type of habitat that aquatic bugs need to thrive. The most important thing to remember if you’re fishing in Noontootla Creek is that you’re being stealthy, you’re taking your time, and that you’re making that first fast count. During the winter, for example, you need to be looking for the trout in different kinds of water. Anglers should be searching for water depths between two to six feet plus in depth. Anything under two feet is too fast. To be able to catch a trophy trout, the most important thing to do and remember is that you have to be able to steer or have control of the fish the best you can at all times during the fight. You have to keep a perpendicular fight to the fish. Another tip is to let the fish run and keep low side pressure and try to work the fish out. Understanding how to use side pressure when fighting fish is critical to gain an advantage and steer it into the direction you want to go. Listen to our full interview with Kent Klewein and learn more about fly fishing for trophy in Georgia’s Noontootla Creek.